In 1818, a lumber merchant tasked with removing scrap wood from the land which had been the Emperor Hadrian’s villa outside Rome, discovered a wooden crate among the lumber on the estate. The crate was carefully opened. Inside was a broken slate tablet with an overlay of dimly visible colors underneath a thick and dust-encrusted varnish. It was difficult to discern the image, but the 16 pieces fit together like a puzzle. Painters were called in to remove the thick, mottled layers of varnish. Colors with an amazing brilliance and polished finish began to emerge. 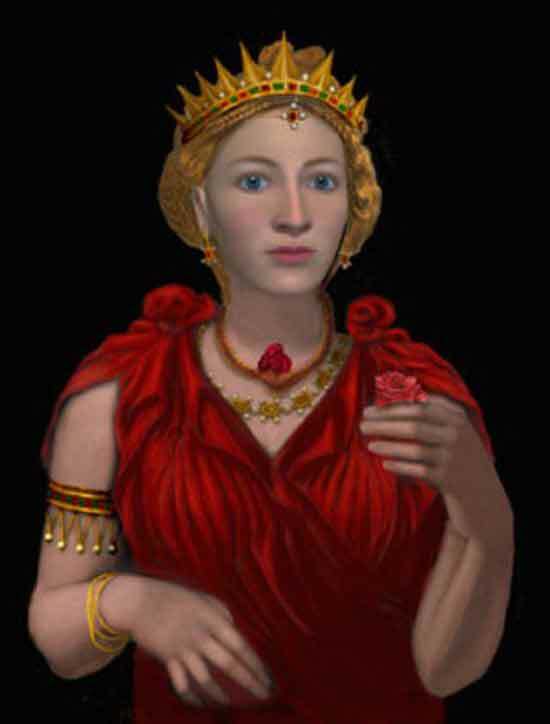 The astonishing picture slowly revealed a figure of a young, beautiful woman clad in a crimson tunic, with a jeweled golden crown. Matching the crown were a set of earrings, necklace and pendant on her forehead that were inlaid with rubies and emeralds, and the jewelry had fine pearls mounted on the edges. A gold armband with pearls suspended on gold chains and a bracelet of gold were on her right arm. But the painting had another, more startling aspect- the young woman had a serpent coiled around her left forearm, and it was in the very act of striking her on the exposed left breast. A pair of puncture marks from a previous strike seeped blood. Her expression was one of profound grief and turmoil. Tears flowed from her sorrowful, upturned eyes. The parted lips revealed the tongue pressed forward between the teeth, as if the serpent’s poison was swiftly taking effect. The Royal person so vividly portrayed could only be Queen Cleopatra, the last Pharaoh of Egypt, consort of Julius Caesar before his assassination and, in later years, the devoted wife of Mark Antony. Further examination by experts revealed even more remarkable elements. The painting itself, on a finely-ground surface of gray slate rock was determined to be a supremely crafted example of the lost art of encaustic painting, employed by the ancient Greeks and Romans. The artists of Caesar’s time mixed powdered pigments in into a heated mixture of tree-resin and wax. The hot, mixed encaustic paint was skillfully applied to the slate tablets with a brass spatula. When the painting was completed, the entire surface was melded into a smooth finish by passing red-hot iron bars or braziers full of glowing embers close to the painting’s surface. But where could the clearly ancient painting have come from? Certainly the artist would have been one of the best of his time, and there is a relatively short era of about 250 years during which the process of encaustic painting was developed and refined. It would necessarily been after the time of Cleopatra since it depicted her death by suicide. This leaves a very narrow time period of perhaps 50 years before the technique of encaustic was lost to history. It is necessary to recall the circumstances of Cleopatra’s death. The Emperor Octavian, Julius Caesar’s nephew, had come with Roman imperial forces to wage war on Marc Antony and Cleopatra, and defeated the Egyptian forces. Marc Antony, returning from battle was told (incorrectly) that Cleopatra had already been killed. Antony then fell on his sword, to commit suicide. Cleopatra, hearing this, rushed to him, and he died in her arms. Cleopatra, who had lived in Rome with Julius Caesar knew of the Roman custom of displaying their prisoners from vanquished nations in their victory parades. Royal prisoners were marched with chains on their wrists and ankles and led through the streets of Rome. The thought was unbearable to Cleopatra, and she devised a way to commit suicide, tricking the Roman guards that Octavian had charged with watching her. Although the accounts vary, the story believed by Octavian was that an Egyptian servant brought Cleopatra a basket of figs, inside which a poisonous serpent was hidden. Cleopatra, with her two faithful attendants, arrayed herself in her finest clothes and jewelry, wearing a crown and ornaments of royalty. She then ate some figs, reaching into the basket until bitten by the asp. Her attendants arranged her on her deathbed and then followed her example. Octavian himself is said to have seen the barely perceptible bite marks on her arm and the serpent’s track marks in the sand outside the temple building. Octavian was furious, having been tricked, and having lost his opportunity to display Cleopatra in chains in his triumphal parade. Later, back in Rome he commissioned an artist, most likely the Greek, Timomachus, to paint a picture of Cleopatra as she committed suicide. (Timomachus had also painted Cleopatra previously when she toured Greece with Marc Antony.) Octavian then displayed the picture on a cart, which was then drawn through the streets in his victory parade. It created a sensation and was viewed by thousands. Later Octavian put the painting on public display in the temple of Saturn in Rome as a votive offering. Years passed and the painting was handed down from emperor to emperor. One hundred and sixty years later, the Emperor Hadrian had an extravagant, palatial villa built outside of Rome at Tivoli. He furnished it lavishly and decorated it with fabulous works of art. The painting was evidently part of his vast collection. At some point in time, likely years after Hadrian’s death, it was carefully packed in a crate and hidden in a cellar, probably for safekeeping in times of war, invasion or the barbarian pillages that occurred in later years. There it lay, forgotten and hidden for centuries until its re-discovery in 1818. Several unique elements of the painting attest to its authenticity and ancient origins. Cleopatra is depicted as the Macedonian that she actually was. Cleopatra was a direct descendant of Ptolemy I, who was both the boyhood friend of Alexander the Great and a general of Alexander’s forces. He was given charge of Egypt by Alexander and installed himself as the new ruler of Egypt. Thirteen generations of Ptolemies ruled Egypt. Cleopatra VII was the last of her generation, and the last Pharaoh of Egypt. Cleopatra, in the highly detailed painting is pictured as having dark blond or auburn hair and deep blue eyes. Alexander the Great, who was ethnically Macedonian, (not genetically related to the coastal Greeks that he conquered) was also blond-haired and blue-eyed. Many Macedonians even today still have the genetic characteristics with the prevalence of recessive genes that produce fair skin and light eye coloration. That fact that Cleopatra was not Egyptian, but a descendant of Macedonian royalty, may be difficult for many to accept, but it is nonetheless true. Cleopatra’s hair was depicted including individual strands, and is arranged in elaborate braids sprinkled with gold dust. This is in complete accordance with the marble sculptures of Cleopatra from Caesar’s Rome. The painting, after its discovery, first passed through the hands of a few owners, at one time even having been pawned. It was later purchased by the Barron de Benneval (French) residing in Sorrento, Italy in 1860, who exhibited it in Paris, London, Munich and Rome. Two engravings after the painting enable us to determine the details as well as concise and written descriptions by eyewitnesses during the mid 1800s. The Greek and Roman busts of Cleopatra show a woman with symmetrical features and smooth skin. There is a moderate bridge to the nose and slightly flared nostrils, but nothing that would be considered out of proportion or the least bit unsightly. At present the whereabouts of the painting appear to be unknown to the general public. Its last recorded location was with the Barron de Benneval in Sorrento. It is likely that in the chaos of wars in the early 20th century, the painting was either hidden for safekeeping, lost in bombing raids or pillaged by invaders. As of date of writing, efforts are underway to locate this great treasure once again. 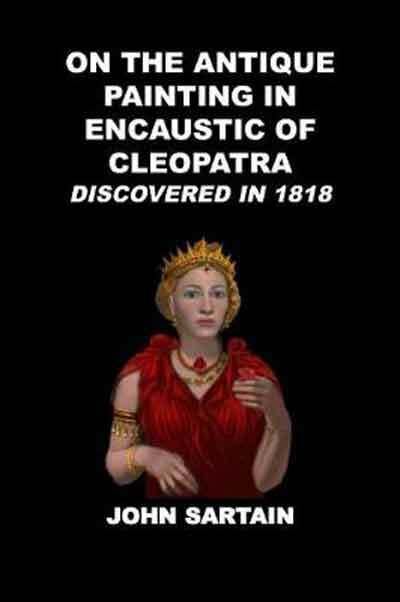 Now, the short book which detailed the painting’s discovery and subsequent exhibition, On the Antique Painting in Encaustic of Cleopatra, Discovered in 1818 by John Sartain, first published in 1885, is back in print for the first time. What did Cleopatra really look like? On the front cover is a replica of the original painting of Cleopatra, commissioned by Octavian Augustus on August 12, 30 B.C. Furious at her suicide, which deprived him of his plans to make her take part in the Roman tradition of parading prisoners in chains through the streets of Rome, Octavian ordered the artist Timomachus (who had earlier painted Cleopatra for Mark Antony) to create a new portrait of the Queen at the moment of her death. The finished portrait, in the encaustic technique, was mounted on a cart that was drawn slowly along the route of the victory parade. It caused a sensation and was viewed by thousands. Later, Octavian had it placed in the Temple of Venus as an offering where it was kept on public display for many years. Many years later, the Emperor Hadrian acquired it for his extensive art collection that was housed at his villa in Tivoli, outside of Rome. The painting, at some time after Hadrian’s death, was place in a wooden crate and hidden in a cellar at Hadrian’s Villa. It lay hidden and forgotten until 1818 when it was rediscovered in a lot of scrap lumber. The painting, broken into 14 pieces, was painstakingly reassembled and copied. 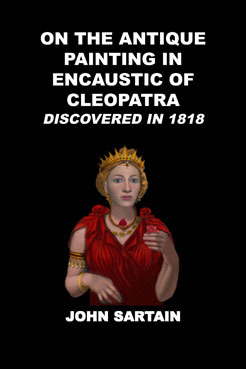 The image alongside was created by 3D computer modeling techniques combined with digital illustration, and is based on the Greco-Roman sculptures of Cleopatra, antique engravings of Octavian’s Portrait of Cleopatra, and detailed eye-witness descriptions from writers, artists and reporters who viewed the painting when it toured Europe in the 19th century.